"Because local anthropogenic emissions make relatively smaller contributions to the [Williamette River] Basin than do persistent global sources (sources over which there is little, if any, possibility of local control), localized environmental management actions alone may not be adequate to address mercury impacts within the Basin." "Mercury and other airborne contaminants collect over China during the winter and spring until Siberian winds arrive bearing dust from expanding Chinese and Mongolian deserts. Every five or six days, the winds flush out eastern China, sending dust and pollutants such as ozone precursors high over the Pacific, says Russ Schnell, observatory and global network operations director for the National Oceanic and Atmospheric Administration. "The ozone on the West Coast in a few years will be controlled not by California and Oregon," Schnell says. "It will be controlled by China." The incoming pollution bucks a U.S. trend toward cleaner skies and water. Mercury is especially suited for long-distance travel because at the smokestack in elemental form, it's insoluble. By the time it reaches the West Coast, however, some of the mercury has transformed into a reactive gaseous material that dissolves in Western Oregon's wet climate. It washes into the river, where microbes convert it into a form that further concentrates in fish. Most of the mercury entering the Willamette comes from Oregon's volcanic soil and from sediment churned up on the river bottom. But Bruce Hope, senior environmental toxicologist of the Oregon Department of Environmental Quality, estimates that global sources beyond the state's control contribute 18 percent --more than four times the share from local air deposition. "If I made every local source go away, would I be able to eat the fish?" Hope asks. "Right now the answer is maybe." Hope was struggling to account for all the Willamette's mercury sources before he encountered Dan Jaffe, an atmospheric and environmental chemistry professor at the University of Washington at Bothell. Jaffe and other scientists were detecting Asian pollutants in monitors atop Mount Bachelor and Cheeka Peak, on the Olympic Peninsula. The monitors regularly record levels of airborne carcinogens equivalent to those of a major city, says Staci Simonich, an Oregon State University researcher. In April 2004, instruments mounted atop Mount Bachelor's Summit Express ski lift intercepted an enormous Asian plume laced with mercury and ozone. The fine-particle concentration hit about 20 micrograms per cubic meter, compared with the federal air-quality standard of an average 65 micrograms during a 24-hour period. "The air we saw on that day was comparable to a moderately bad day in Portland," says Jaffe. "When you consider that that air has traveled thousands and thousands of miles, it's pretty amazing really." 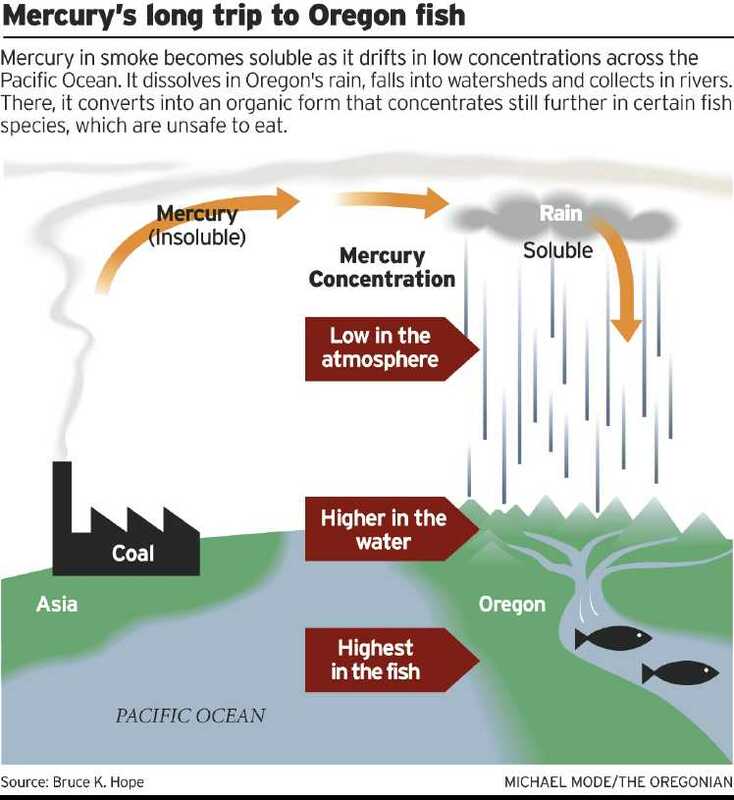 Jaffe calculated that Asia emits 1,460 metric tons of mercury a year, twice as much as previously thought. To be sure, concentrations of foreign pollutants in Oregon are minimal compared with federal air-quality standards. On an average spring day in the Northwest, the overall sulfate concentration reaches just 0.72 micrograms per cubic meter, says Colette Heald, a University of California at Berkeley researcher. About one-quarter of the average sulfate level comes from Asia, Heald says. (continuing): "Especially if China's share increases, Hope says, Oregon can do little to reduce contamination of the river even by cracking down on emissions, eliminating mercury from products and segregating waste. "Because of foreign sources, the kinds of management changes that would be acceptable would probably not be enough to let us eat the fish." Oregon officials have warned since issuing a 2001 advisory that Willamette bass and pikeminnow bear unsafe mercury levels. Mercury acts on the central nervous system and can reduce mental ability, making kids shy, irritable, and slow to learn, and causing tremors and visual disturbances. Children under 7 should not eat more than a single 4-ounce portion of nonmigrating fish every seven weeks, while women of childbearing age should eat no more than one 8-ounce portion a month. The DEQ has a mercury cleanup plan for the Willamette that will take decades. But "you throw in the global contribution," says Dave Stone, Oregon public health toxicologist, "and it does become that much more complex." Oregon, which has 14 fish advisories for mercury, has not been able to lift one. The added mercury from abroad, coupled with Oregon's high natural levels, could concentrate pressure on local emitters under the DEQ's cleanup plan. Weyerhaeuser, for example, has more than 15 plants in the watershed. "We're concerned to the extent that we have to do something that won't matter," says Marv Lewallen, Weyerhaeuser Oregon environmental affairs manager. It's not just the Willamette that will be difficult to clean up because of mercury beyond local control. Scientists expected to find patterns of mercury pollution from nearby factories when they took sediment samples beneath lakes near Bellingham, Wash., that contain fish unsafe to eat. Instead, most of the industrial mercury came from global sources. "Our best estimates indicate that there's more mercury deposited in this country from outside our borders than from inside our borders," says Richard Scheffe, U.S. Environmental Protection Agency senior science adviser. 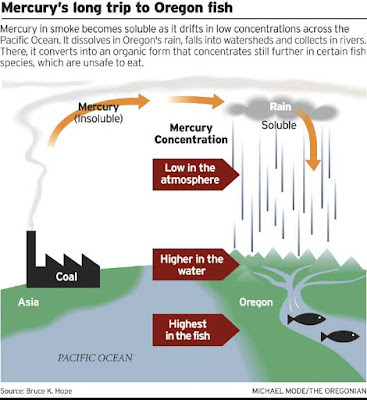 Mercury is just one of the foreign pollutants that scientists are tracking. At least one-third of California's fine particulate pollution --known as aerosol --has floated across from Asia, says Steve Cliff, an atmospheric scientist at the University of California at Davis. "In May this year, almost all the fine aerosol present at Lake Tahoe came from China," says Tom Cahill, a UC Davis emeritus professor of atmospheric sciences. "So the haze that you see in spring at Crater Lake or other remote areas is in fact Chinese in origin." Cliff says China's growing contribution will complicate U.S. efforts to meet annual average emissions standards. "As you try to reduce particulate pollution from local and regional sources, you're only reducing to some background level," Cliff says. "The concern is that as China continues to expand, that background level will only tend to increase." A recent court decision raises the possibility that foreign firms could be held liable for polluting the United States. A 9th U.S. Court of Appeals panel ruled that Teck Cominco Ltd., a company that discharged heavy metals and slag in the upper Columbia River in Canada, must pay to clean up a downriver stretch in the United States. Scientists are frustrated by a lack of data from Asia, where factories often aren't required to report what they emit, says Richard "Tony" VanCuren, a UC Davis applied-sciences researcher. One thing is certain, though, because of geography and wind: "The maximum impact from Asia," Heald says, "is going to be in the Northwestern United States." Image source: "Bruce Hope, senior environmental toxicologist of the Oregon Department of Environmental Quality"
“Air pollution from China, India and several other Asian countries has wafted across the Pacific Ocean over the past 25 years, increasing levels of smog in the western U.S., a study finds. Smog, also known as ground-level ozone, is harmful to human health, because it can exacerbate asthma attacks and cause difficulty breathing. It also harms sensitive trees and crops. It’s different than the “good” ozone up in the stratosphere, which protects life on Earth from the sun’s harmful ultraviolet rays. Scientists measured ozone levels recorded at springtime for the past 25 years in 16 national parks in the western U.S., including Yellowstone, Yosemite and Grand Canyon. The parks’ locations farther away from cities, where smog is typically expected, made them ideal spots for the study. The team looked at levels in the spring when wind and weather patterns push Asian pollution across the Pacific Ocean, said Meiyun Lin, a scientist at the National Oceanic and Atmospheric Administration who led the study. In the summer, when those weather patterns subside, ozone levels in the national parks remained well above normal. Asian air pollution was, by far, the biggest contributor to smog in the West, the researchers found. The team also looked at other factors, such as wildfires and methane from livestock. Asian air pollution contributed as much as 65% of the western U.S. ozone increase, while wildfire emissions supplied less than 10% and methane about 15%. Since 1992, Asia has tripled its emissions of smog-forming chemicals such as nitrogen oxides. Though China and India are the worst offenders, North and South Korea and Japan also contribute, said Lin, who is also a research scholar at Princeton University. The smog levels in the western U.S. have increased each year despite a 50% reduction in U.S. emissions of smog-forming pollutants. “Twenty years ago , scientists first speculated that rising Asian emissions would one day offset some of the United States’ domestic ozone reductions,“ said Owen Cooper, a senior research scientist at the University of Colorado and NOAA, who was not directly involved in the study. Now that prediction has come true, he said. Asian pollution only slightly contributes to smog in the eastern U.S., the study found. Levels there typically spike during intense summer heat waves.